Our teams are comprised of students ages 6-10 from across the community and is mentored by members of our FIRST LEGO League and FIRST Robotics Competition teams. Our main FIRST LEGO League Jr. W.A.F.F.L.E.S. teams meet every week for an hour over a 8-12 week period in the fall at the Pump House Steam Museum. Parents are required to stay for the lesson and then assist their child’s team in developing good teamwork skills and helping them stay on track to accomplish their daily goals. Our FIRST LEGO League Jr. teams a similar theme to our FIRST LEGO League team and have fun learning and building their own creation out of LEGO. 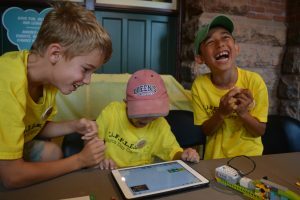 Our season wraps up with a wonderful local FIRST LEGO League Jr. Expo. FIRST LEGO League Jr. is a great introduction to engineering and teamwork! Please note: This is not a drop off program. *We also operate teams through our Summer Camp. These teams work daily on their projects and end the week off with a small Expo.